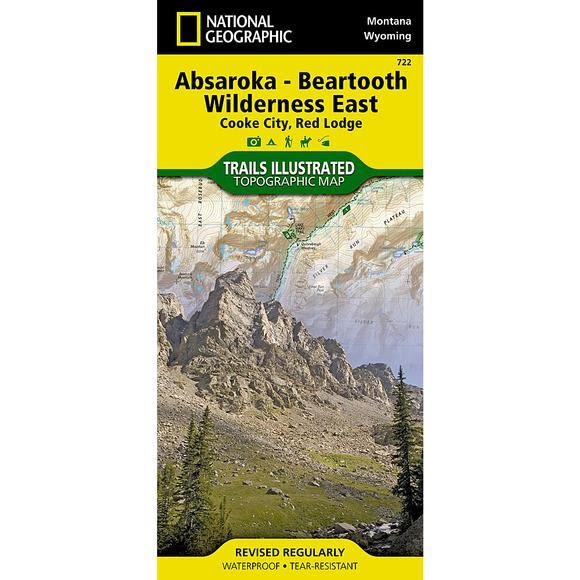 National Geographic's Trails Illustrated map of Absaroka-Beartooth Wilderness East delivers unmatched detail and valuable information to assist you in your exploration of this breathtaking wilderness. The area's unique terrain, with snowcapped peaks, glaciers, alpine lakes and plateaus is the map's core feature, with detailed elevation contours, shaded relief, vegetation, and water features. National Geographic&apos;s Trails Illustrated map of Absaroka-Beartooth Wilderness East delivers unmatched detail and valuable information to assist you in your exploration of this breathtaking wilderness. The area&apos;s unique terrain, with snowcapped peaks, glaciers, alpine lakes and plateaus is the map&apos;s core feature, with detailed elevation contours, shaded relief, vegetation, and water features. Expertly researched and created in partnership with local land management agencies, the map features key points of interest including East Rosebud; Mystic Lake; Stillwater River; Cooke City; Red Lodge; Beartooth Highway Scenic Byway; and portions of Gallatin, Custer, and Shoshone national forests. This map can guide you off the beaten path and back again with over 700 miles of mapped trails including trails for hiking, cross-country skiing, horseback riding, and snowmobiling. Trail mileage between intersections will help you choose the path that&apos;s right for you. Recreation features are clearly marked including campgrounds, trailheads, ski areas, fishing and boat access, and points of interest. A variety of helpful information about stock use, recommended backcountry camp setup, and bear safety tips are included as well. Other features found on this map include: Absaroka-Beartooth Wilderness, Beartooth Mountains, Castle Mountain, Cathedral Peak, Custer National Forest, Gallatin National Forest, Granite Peak, Granite Range, North Absaroka Wilderness, Pilot Peak, Shoshone National Forest, Silver Run Plateau, Yellowstone National Park. Measurements 37.75" x 25.5", Folded: 9.25" x 4.25"